Hello Italian Ricotta Cookies! These are so yum! Soft and Light! ...and the best part...they are so simple and quick to make!!! Cream the butter and sugar in a medium sized bowl. Add in the ricotta, egg, and vanilla extract until well mixed. *Don't over beat this mixture so they will stay fluffy and light! In another bowl: Mix together the flour, baking powder, and baking soda. Slowly add the flour mixture to the ricotta mixture and mix until combined. Roll the dough into about 1 inch sized balls and place onto an ungreased cookie sheet, about 2 inches apart. * Tip: Lightly wet your hands so the batter doesn't stick to them! Bake 8 minutes or until lightly browned. Allow to cool for a few minutes on baking sheet. 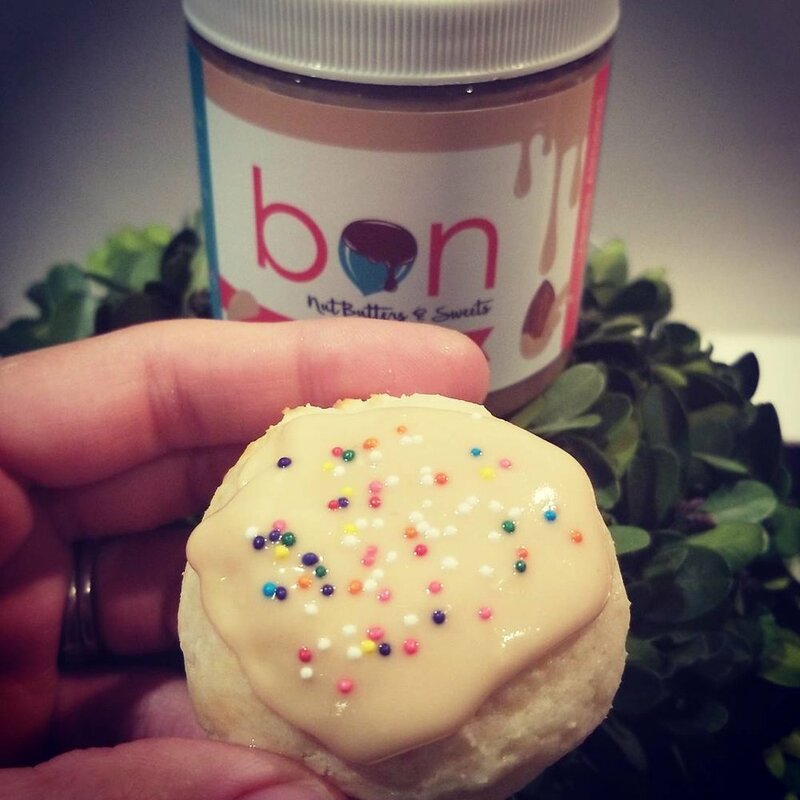 Spread your favorite bon Nut Butter over top and add sprinkles! Ohhh....we can't wait to share this recipe with you. As you will see on our Instagram Page: @bonbutters, incase you didn't know already...these Pastries are delish!!! Don't fret...they are actually super simple to make! Prep Time on this is about half hour and Bake time is 16-20 minutes. In a small bowl stir together 1 cup powdered sugar, 1 Tbsp. milk and 1/4 tsp vanilla. Stir in addition milk, 1 tsp. at a time, to reach desired drizzling consistency. 1. In a food processor, place the flour, sugar, salt, butter and egg. Pulse until crumbly. Add 1 Tbsp. milk at a time until mixture is a smooth consistency. If needed, cover with plastic wrap and refrigerate until ready to use. 2. Preheat oven to 375 degrees F. Flour a surface lightly and flatten the dough using your hands. Roll pastry and use cookie cutter in a square shape to cut out shapes. 3. Spread hazelnut spread. *OR* Spread a slice of guava paste + a tsp. of cinnamon cashew butter on top of half of the square shapes you cut out. Moisten the edges with milk and use the remaining half of the squares to cover the filling. Press with a fork around the edges. Prick top of pastry with a fork. 4. Place each pastry onto a non-stick cookie sheet using a spachula and bake until golden brown for 16-20 minutes depending on the size of your shape. Remove and cool on a wire rack and drizzle with Icing and add sprinkles. 5. Hashtag #bonbutters and Enjoy! These Peanut Butter and Caramel Cookies are the absolute best eaten warm with a cold glass of milk or nut milk! A Peanut Butter lovers dream cookie! 2. In a small sauce pan melt butter on medium heat until it has become a golden brown color. Remove from heat. 3. In a medium bowl mix applesauce, both sugars, egg and vanilla together. 4. Combine together with browned butter. 5. Mix in your, oats, flour, salt and baking powder. Once your dough has come together refrigerate for 20 minutes. 6. Once the dough has chilled roll into 12 equal sized balls (using a cookie scoop). Place each cookie dough ball on a parchment paper lined cookie sheet about 2 inches a part. 7. Push a caramel square into the center of each cookie dough ball and form the sides up a bit so the caramel pools in the center as it bakes, otherwise it will run off the sides. 8. Dollop a tsp of peanut butter on the top of each caramel. 9. Bake for 12-14 minutes or until the cookies are golden. These Waffle Sandwiches are perfect for busy mom's looking for new ideas for your little ones. Nutritious and delicious - these will disappear in a snap! Prepare the waffles according to the package instructions. Spread 1 tablespoon of peanut butter on each waffle. Layer the sliced banana on one waffle and drizzle with honey (if you choose). Put the sandwich together and grill over a lightly butter hot griddle until golden brown. This smoothie super creamy and a delicious way to start off your day right! 1. Add all ingredients into a blender and blend until all ingredients are combined and figs are chopped to a drinkable consistancy. Overnight oats are a nutritious way to enjoy breakfast when you are on-the-go in the morning. On a flat surface, place 4 bowls or lidded glass jars (like mason jars). Fill each with ½ teaspoon ground flax, ½ cup oats, ¾ cup milk, 1/8 cup raisins, 1/4 tablespoon cinnamon and 1 tablespoon almond butter. Peel and mash bananas. Divide evenly into the four jars over oat mixture. Pour milk in milk and combine ingredients. Refrigerate for 8 hours or overnight. When ready to eat, serve cold or warm up for 45 seconds in the microwave. Slice a banana, top each oat mixture with banana slices and drizzle 1 teaspoon of honey over the top or as desired. bon is a mom-run business located in the Sourland Mountains in Central NJ. We started making small batch Nut Butters & Spreads using an old artisan technique of stone-grinding-stone. The whole idea came about as an accident really...but has since become wildly popular with the locals. We also make hand rolled and molded chocolate treats, marshmallows, coconut macaroons and more! Our treats are sublime! and yes...WE SHIP!